Republic lost Gene Autry to WWII service, but they still had sidekick Smiley Burnette who was not without fans of his own. After partnering ol’ Frog with Roy Rogers for a few films, Republic prexy Herbert J. Yates apparently figured Smiley would be of more value bolstering up their new John Paul Revere series with Eddie Dew. Republic had always maintained a policy of offering exhibitors four different western series each season. They now had Roy Rogers, Don Barry and Bill Elliott. The decision had been made to drop the faltering Three Mesquiteers films, so was created John Paul Revere. 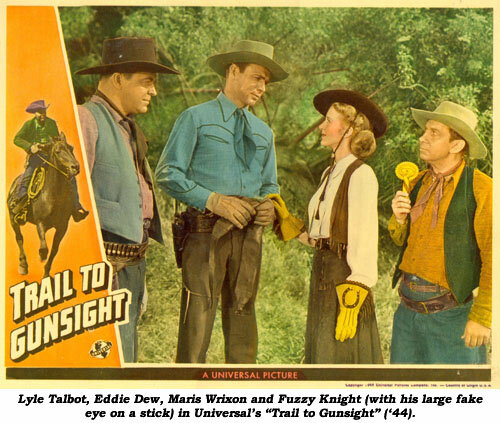 Hired to play the part was Eddie Dew who’d been playing character roles mostly in Tim Holt RKO’s. 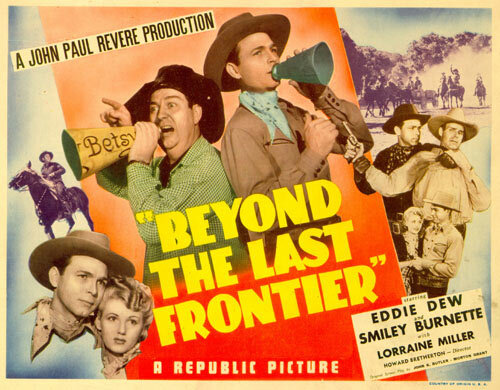 “Beyond the Last Frontier” was the initial outing, but after only one more Dew was replaced by Bob Livingston while Eddie quickly rode over to Universal. Unfortunately, the reasons, whether it be salary, audience reception to the first Dew film, fan mail, egos or whatever, are long lost to time. Perhaps it was simply because good/badman Robert Mitchum walked away with the honors in this film. It’s a real star-turn for the sleepy-eyed actor who was also now making a mark in Hopalong Cassidy films. 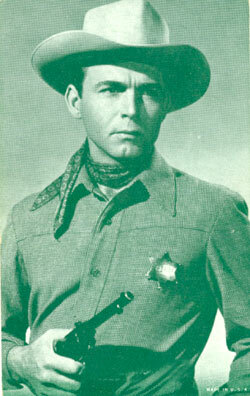 Republic should have snapped him up, but RKO beat them to the punch, starring Mitchum in Zane Grey westerns in ‘44. Here, Texas Ranger Dew poses as an outlaw to spy on Harry Woods’ gang of ore raiders. Realizing there must be a spy among them, Woods retaliates by likewise planting a spy among the Rangers, reckless young adventurer Mitchum. Later, Mitchum finds Woods’ brutal treatment of Ranger Frog Millhouse (Smiley Burnette) too much for his taste, and saves Frog from dying in a burning barn. The good/badman eventually sides with Dew and turns the tables on Woods’ gang. It may be Dew’s debut as a cowboy star, but it’s Mitchum’s movie all the way! 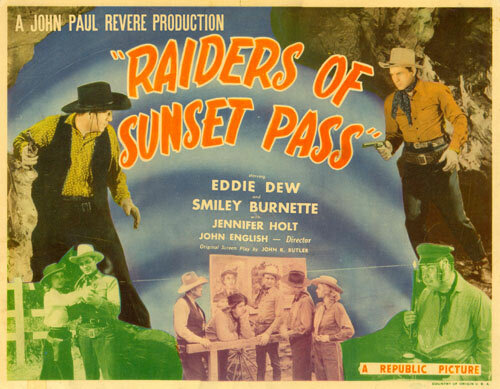 “Raiders…” has an intriguing WWII theme: ranchers use Jennifer Holt and other cowgirls to round up the dogies and fight rustlers Le Roy Mason and Roy Barcroft during the manpower shortage. They’re termed WAPS, Women’s Army of the Plains. Among the ladies is Maxine Doyle, director William Witney’s actress wife. When the Dew series simply didn’t click he left (or was let go) in December ‘43 after only two films and wound up a year later playing second fiddle to Rod Cameron. (Sunset Carson was waiting in the wings at Republic.) Dew later fashioned a decent career as a pedestrian director (“Sgt. Preston of the Yukon” and many religious TVers). Bob Livingston finished out the failed John Paul Revere series. Dew was elevated this one time to star status at Universal for this B with Lyle Talbot taking his place as second banana. Worst thing about this oater is the unfunny antics of Marie Austin! Universal’s resident sidekick Fuzzy Knight was hard enuf to take on his own, but teamed up with her, it’s a disaster! Includes one of the silliest gags in B-western history: Fuzzy has a large fake eye on a stick with which he hypnotizes others—and himself! Child star Buzz (Buzzy) Henry is in this one. He’d begun in Ken Maynard’s “Western Frontier” (‘35) at only 3½ years old. He went on to be a top stuntman in films like “The Wild Bunch”, “Major Dundee” and “El Dorado” before being killed in a 1971 motorcycle accident at only 40. 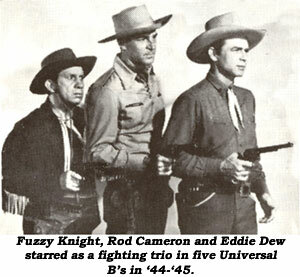 Shortly after his Universals Eddie Dew made this 20 minute curiosity at Paramount. It’s an odd mixture of musical western (Dew sings solo and duets with Julie Gibson), comedy and out and out vaudeville (Frank and Jean Hubert’s inebriated act). New Marshal Dew stops stagecoach bandit/saloon owner Bernard Nedell and his henchies (Syd Saylor, LeRoy Mason) without breaking a sweat. If a singing cowboy could become popular, why not a singing cowgirl series? Grand National gave pretty, blonde Dorothy Page a three film shot (under a production unit called Colorado Films headed by George Hirliman) but it just didn’t click. Additionally, financial troubles engulfed the young company by ‘39. Samuel Diege directed the three Page B’s with an eye for speed, but, save for them and “King of the Sierras” (also produced by Hirliman for Grand National), he was never heard from again. 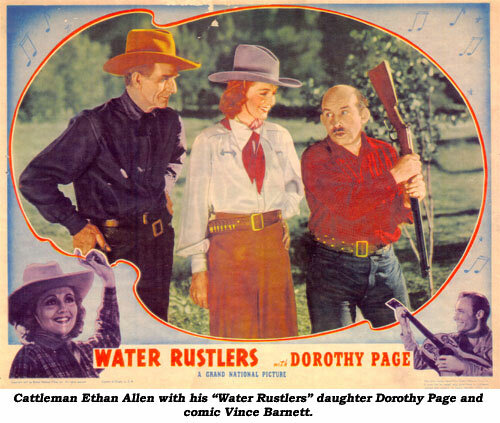 Hirliman had quite an association with westerns. Born in 1901, he was involved in various aspects of the film laboratory business from 1916 until 1927 when he sold his lab to Herbert J. Yates. Hirliman then founded Exhibitor’s Screen Service which he sold to National Screen Service in 1933. From ‘33-‘35 he worked as production exec for Yates at Consolidated Film Industries. When Yates masterminded the Republic merger in 1935, Hirliman signed George O’Brien and formed his own production company, securing an RKO release agreement. After four films, “Daniel Boone”, “Park Avenue Logger”, “Windjammer” and “Hollywood Cowboy”, Hirliman sold O’Brien’s contract to RKO, making them authentic RKO efforts. Hirliman then set up Condor Pictures with Max Hoffman who produced the first two Ken Maynard releases (“Boots of Destiny”, “Trailing Trouble”) through Grand National in ‘37. Hoffman became ill (he died in ‘38) and sold Maynard’s contract to the Alexander brothers. In ‘37-‘38 Hirliman was president of Harry “Pop” Sherman’s company making Hopalong Cassidy westerns at Paramount. Hirliman perfected the process known as Magna Color. He also formed Metropolitan (no relation to the low budget B. B. Ray/Harry Webb company) to make Spanish language versions of his movies. In ‘43, following the Page films, Hirliman formed the re-releasing company, Film Classics, who bought the theatrical re-issue rights to the Cassidy films in ‘46 (except for the first six which had been sold to Sherman Krellberg in ‘41.) Page could certainly handle the songs, problem was you always needed a male, like Dave O’Brien here, to handle the rough stuff needed in a western. In this, the first of three Page managed before Grand National’s demise, ruthless mine owner Stanley Price is in league with Page’s duplicitous foreman Warner Richmond to siphon off all the water in the valley for his water-wasteful hydraulic mining operation. 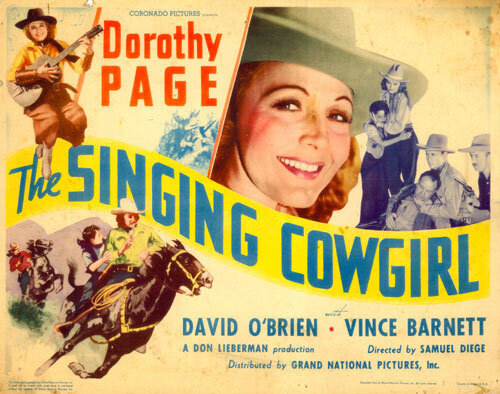 The second of three singing cowgirl westerns starring Dorothy Page who had worked her way up from small roles in features such as “Manhattan Moon” and “Mama Runs Wild” in the middle ‘30s. Page was pretty, sang a tune beautifully and sat astride a horse believably, but Grand National put far too little production dollars behind the series. Besides that, when it came to the action, directors had to bring in a male, in this case Milton Frome, badly miscast as a leading man. He found much greater fame later on as a comedic actor. Plot has silver smuggler Harrington Reynolds operating on Dorothy’s ranch, setting her up on a false robbery charge to get her out of the way. It has its moments but that’s about all. Dorothy and Dave O’Brien stop a landgrab by outlaw Stanley Price. Page signs a very mournful “Prairie Boy” and another, “Round-up Your Dreams”, twice.